Richard Harris used to drink here. Angela McCourt used to buy single cigarettes here. The Cranberries used to play house shows here. Kevin Barry used to be a courthouse reporter for The Limerick Post here. For 12 days in 1919, the free and independent Limerick Soviet printed its own money here. President Michael D. Higgins used to wear knickers here. 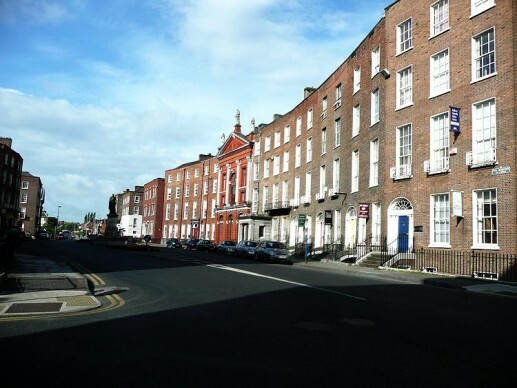 But all that is in Limerick’s past, rich in cultural export, but overshadowed in the media by a history of crime, poverty, and the stigma of the obsolete moniker “Stab City.” In the present, the city is filled with imported and home-grown optimism in a revitalized city center and a refiguring of Limerick’s popular perception. If you want a city buzzing with energy and excitement, balanced by a slow pace and friendly conversation, now is the perfect time to visit a city on the brink. The optimistic energy is spurred by a successful bid as Ireland’s first City of Culture for 2014, modeled after the Derry~Londonderry UK City of Culture and Liverpool’s designation as the European Capital of Culture for 2013. Despite some difficulties during the fledgling stages of planning in late 2013 and controversy surrounding the departure of the original director on January 2nd, the initiative has funded over 100 projects, including walking tours, street art, original theater productions, and numerous art installations. When I visited in June, the Cardiff-based NoFitState circus was in town at the site of the former Dell factory outside of the city center. James Galway has performed for City of Culture, artists from Israel, Sweden, Panama, Bilbao, and elsewhere are exhibited throughout the city. Van Morrison was announced as the headliner of the Jazz Festival, and in January, Riverdance, whose composer Bill Whelan was born in Limerick, kicked off its 20th anniversary tour at the University of Limerick Sport Center. 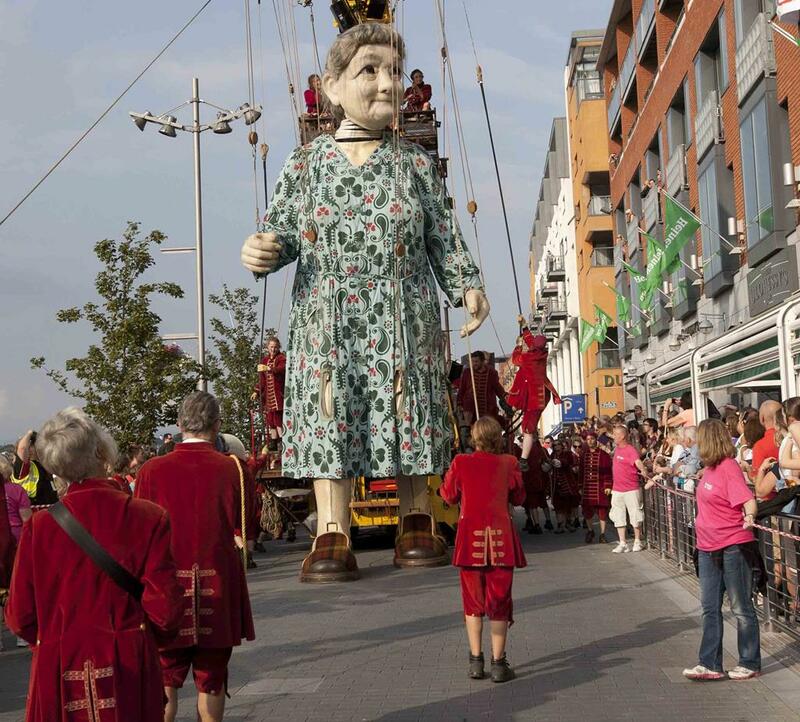 As this article goes to press, a giant French puppet named Granny is walking down O’Connell Street. Current estimates put the influx of spectators at roughly 200,000 people, more than twice the population of the city. It’s not all international culture stars though, and City of Culture has made efforts to support local artists who are at risk of being forgotten once the circus leaves town at the end of the year. The influx of capital for Limerick-based artists has allowed many to increase the scale at which they work, making their projects highly visible throughout the city. 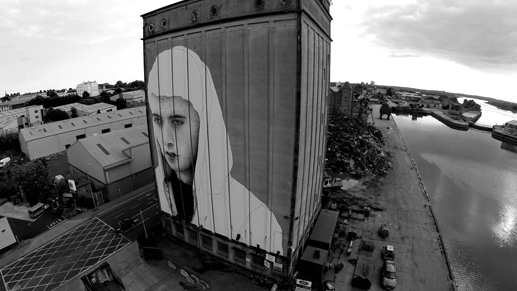 The seven-story portrait of a Limerick teen male in a hoodie on the side of the unused Ranks Silo on the Docks Road is a case in point. “His image showcases the image of the young men of the city, so he speaks to them,” says Joe Caslin, the creator of the piece. The confrontational nature of the installation is par for most of the projects in the city. Caslin says this shouldn’t be surprising given the city’s tough urban history. “It’s great because there’s a beauty that sits within the city as well, but there’s also this kind of edginess and Limerick has started to embrace that edginess, and not see it as a negative,” he says. Part of the focus on public art is to repurpose abandoned commercial and industrial space for cultural aims. Katherine O’Halloran, director of the Draw Out Urban Exhibitionists project, another project funded by City of Culture, wants to create a city that is less reliant on commercial enterprises. “Draw Out’s vision is that we, as a city, are no longer hindered by consumer-focused function but are ambitious enough to create dynamic examples of the highest quality art work that can live ‘outside.’” she says. Draw Out’s flagship project for City of Culture was to transform a semi-derelict gas station into something of a cross between a mural and a sculpture. The entire space, including two cars, have been painted in bold color blocks by the renowned Irish graffiti artist Maser. It is a work that “surprises people and questions their relationship with the familiar and the norm,” he says of the gas station project. “Also how dissociated we are from the space around us,” he adds. It’s easy to imagine the gas station as an often-passed but little- considered lot on Parnell Street. But now it is impossible to overlook. That, according to O’Halloran, is the point of such large-scale public installations in the city. In this way, many of the projects embrace the post-industrial past of Limerick, drawing attention to forgotten spaces. One of the largest projects for City of Culture involved the Dell factory, which has lain vacant since 2009 when Dell moved its productions to Poland, costing the city nearly 2,000 jobs. Now, it’s being reimagined as the Culture Factory, an events space for large-scale, international, avant garde productions. Already, it’s hosted several shows. The first, which toured through town last March, was Fuerzabruta, an Argentinian performance that took place, “overhead, along, on your back – everywhere,” according to company manager Mariana Mele. When I toured the factory in June, NoFitState circus had their big top set up outside the space, whose high ceilings weren’t high enough to hold it. That question of legacy is one that is perpetual throughout the city. Not only for after City of Culture, but to what extent the troubled history of Limerick should be preserved. Indeed, not all of Limerick’s past appears to be interpreted with the same intent of reclamation. For much of the 20th and into the 21st century, Limerick has had a reputation dogged by poverty, gang violence, drug abuse, and political cronyism. Arguably, the most famous piece of culture to come out of Limerick was Frank McCourt’s blockbuster memoir Angela’s Ashes. But while Angela’s Ashes is a feat of personal storytelling, it didn’t exactly help Limerick’s image that the most famous book about the city was also about escaping it. For fans of the book though, the Frank McCourt Museum is one of the gems of old Limerick. Founded just a few years ago by Una Heaton, who serves as its director, the museum occupies the top floors of the stately Georgian Leamy House, where McCourt used to attend school. 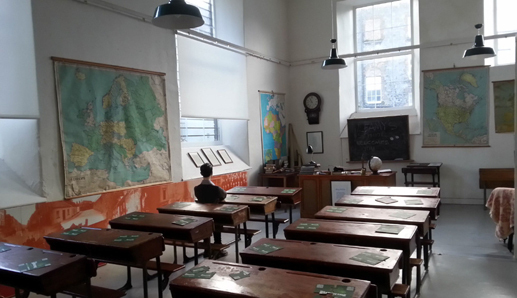 The museum displays a lovingly curated assortment of the author’s possessions, including his personal copy of Angela’s Ashes which he would take on book tours, and his collection of rosary beads, as well as artifacts from the 1930s in a reconstructed primary school room. Upstairs, the McCourts’ two-room apartment has been recreated as it would have looked when the family lived just around the corner from the school. In fact, most of the namesake lanes in Limerick were razed by the city in an effort to curb crime and poverty rampant in the narrow alleys. They were replaced by social housing projects, in which 40 percent of Limerick’s population currently lives. It might be for this reason that the city seems a little ambivalent about honoring the writer – the history is too close and the city hasn’t completely addressed the underlying social issues in the underprivileged neighborhoods. And so, the obvious question, as it always must be with such high-budget revitalization efforts, is will it be successful? Leaving that unanswered for the moment, it’s important to remember that in spite of this being the branded year of culture in Limerick, many of the organizations, festivals, and institutions that received funding from City of Culture have been around long before. It’s not that this isn’t a zeitgeist for contemporary Limerick’s image, but it would be inaccurate to say this event is a pure renaissance – Limerick’s comeback has been in utero for over a decade. The Limerick Jazz Festival is now in its third year as well as the Frank McCourt Museum. The Hunt Museum has a small but impressive range of art dating from the bronze age to the contemporary (my favorite was a video installation called “Lunch to Last Call” by a Swedish artist who cut audio-less CCTV footage of a local Limerick pub into nine 90-minute clips – both humorous and haunting). The Irish Chamber Orchestra is based in Limerick at the University of Limerick’s World Academy of Music and Dance, and the EVA International art biennial has been staged in Limerick since 1977. But the City of Culture is also only a part of the revival effort, looking to the city and its citizens. The other part of revitalization is increasing the profile of Limerick across Ireland and abroad. 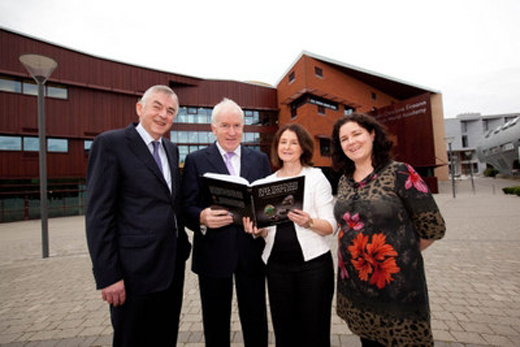 For its part, the University of Limerick is working to effect that shift. Dave Mahedy, the director of sport at the University of Limerick, says that the aim of the center is to make the college Ireland’s Sports Campus, and create an environment suitable for a training destination. The Munster rugby teams all practice there, it’s the training facility for the Irish paraolympic team, and it hosts tournaments throughout the year. When I spoke with Mahedy, the Kennedy Cup was underway in boys under 14 soccer, with European scouts already there. Across the River Shannon, which cuts through campus, is another expansion project. The World Academy of Music and Dance is the only academy of its kind that mixes performance and academic rigor in Ireland, along with requiring a strong community outreach component, says director Sandra Joyce. One project the Academy is heavily involved in, in partnership with the Irish Chamber Orchestra, is Sing Out with Strings, which provides weekly workshops in song-writing and violin tuition for 300 children across Limerick. The Academy also offers an M.A. in music education and an M.A. in festive arts, both of which have been quite popular because they are community-based programs that insert students into the culture of the city to plan, organize, and curate events in the center. President of UL Don Barry agrees, and so does the Limerick City Council, who are in the planning stages of moving some university dorms and some departments to the center to give it a jolt of youthful energy. “One of the challenges to the city is that due to bad urban planning, people have been sucked out of the city center into shopping centers that have grown up on the outskirts of the city… and students are a really strong regenerating force because they drink a lot of coffee and a lot of beer and they socialize more,” he says. Limerick is just 12 miles east of Shannon Airport and roughly 2 hours by train, bus, or car from Dublin. Located almost exactly halfway between Cork and Galway, it is an hour and a half by bus, train, or car from both. Plan your trip with Tourism Ireland at ireland.com. There are many centrally-located hotels in Limerick for all budgets. Adam Farley stayed at No. 1 Pery Square, a hotel, spa, and brasserie wrapped into one where the rooms are named after famous Irish figures. 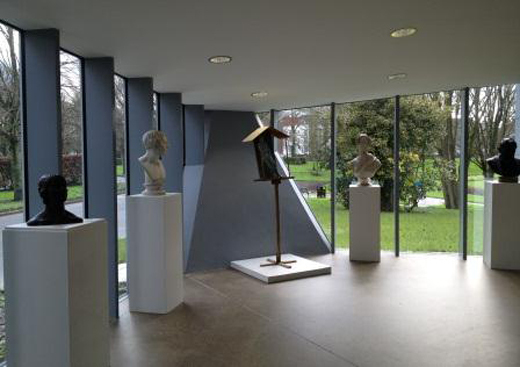 It is located across the street from People’s Park and the Limerick City Gallery of Art, a contemporary art museum with local and international shows. Rates from $137/night, with full breakfast included. 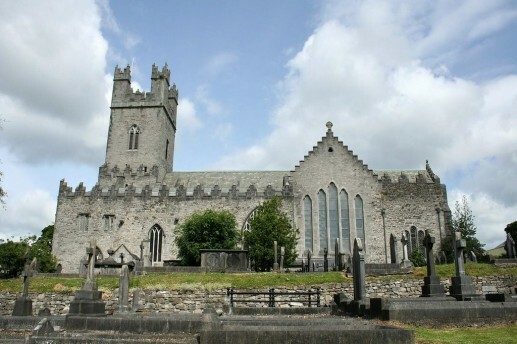 St. Mary’s Cathedral, this Church of Ireland house of worship is the city’s oldest standing structure. Though it has been extensively expanded since 1168, remnants of the original church can still be seen on the west façade. King John’s Castle, dating from the 13th-century, the castle recently underwent a major renovation and the addition of a modern visitor center. The Treaty Stone, where the Treaty of Limerick was signed in 1691, is located just across the bridge from King John’s Castle on Clancys Strand. The Milk Market, an all-week panoply of artisanal food, drink, and local music, is one of Ireland’s best open air markets. They even claim it’s better than Cork’s English Market. The Limerick Boat Club, whose 137-year-old roof was blown off in last winter’s storms, doesn’t rent out kayaks anymore, but NevSail Watersports does. As does the University of Limerick. Wonderful article on Limerick, which has even more than this to offer. There is something for every taste, you just have to look for it (which is true of every city).